Nowadays the popular quote – “If you want to get something right, do it yourself”, becomes more relevant. Moreover, we usually need to get the result right here, right now. Whether it is a choice of food, partner, decision, etc., we all want to have this possibility – to choose ourselves and have the result quickly. You’ll ask: “Where is the connection between this “choice talk” above and on-demand reporting?” – we’ll say: “It is closer than you can think”. What are on-demand reports about? Operating the huge amount of data requires constant reporting. A regular generated report usually has a standard template and created according to the schedule. But what if the user need it right now and in the relevant unique form? That what is on-demand report about. On-demand reporting is a business intelligence model in which reports are generated and distributed by real users in real time. That means that the end-users can easily build a report anytime they need no matter where they are. The main peculiarity of this model is that users don’t need technical knowledge to create the report. Moreover, on-demand report will be unique, will contain relevant information, will meet the requirements of a specific end-user and is compiled according to his preferences. As the market is constantly changing there is a strong necessity to follow and adopt new conditions. On-demand reporting in this case is the best solution to keep abreast of developments and change data accordingly. Not every business has IT specialist among the staff. Moreover, some changes require immediate actions and decisions. That is why reporting system should be efficient and easy-to-use. On-demand reports do not require technical skills and can be operated by simple users. In contradiction to parameterized reports on-demand reports can be developed and changed according your needs. Users can add and change the data, choose parameters and design in order to generate convenient and clear view for the report. select from your saved personalized report layout settings on the server and to use it for further work at any time from any place. Flexibility – as it provides relevant information and created in real time. Easy-to-use – as there is no need to have some special technical (or IT) knowledge to create the report. Sharing the data and team collaboration – users can easily share their reports and data between the team and other users. Uniqueness – as it is created by the user himself the report contains all the necessary data and meets all end-user’s preferences. In Ranet OLAP data analysis tool there is an interactive analytical report called Ad Hoc Report. With the help of it users have at their disposal all the benefits from on-demand reporting. Ranet OLAP tools provide end-users with wide options for ad-hoc data analysis and reporting. To make an ad-hoc report you just need to drag-and-drop elements from OLAP Cube Browser to the Selection Panel, which forms the structure of the soon-to-be pivot table. Ranet OLAP empowers end-users to ask their own business questions and analyze data without burdening the IT specialists. You can create interactive OLAP reports on the fly, export and save them, share them with other users. 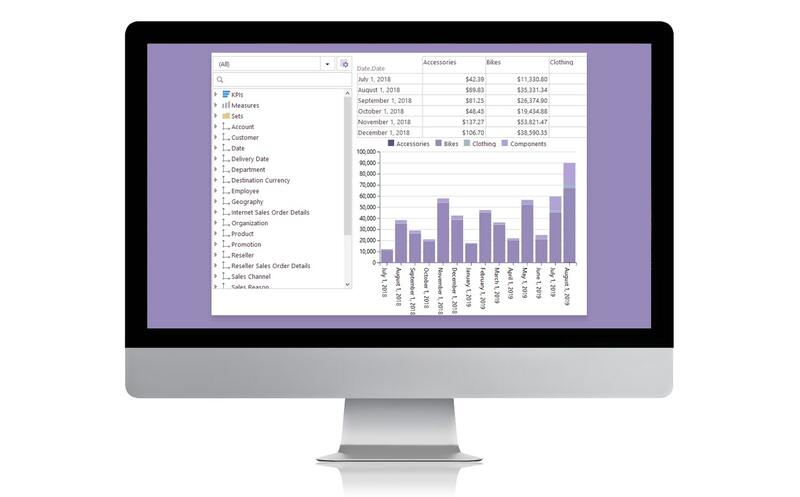 Make your business even stronger and try using the OLAP online demo.